LAWRENCEBURG, IN (May 28, 2012) – Donny Schatz was hoping to make it two straight wins at Lawrenceburg (Ind.) Speedway on Monday night. He won the Outlaws last stop on the 3/8-mile high banks back in the summer of 2009 and was coming off an impressive run in Charlotte. Unfortunately, things didn’t get started well and Schatz did his best to close the night with an 11th-place finish. Qualifying 19th in the field of 34 cars was not the way the four-time WoO champion wanted to begin the evening. 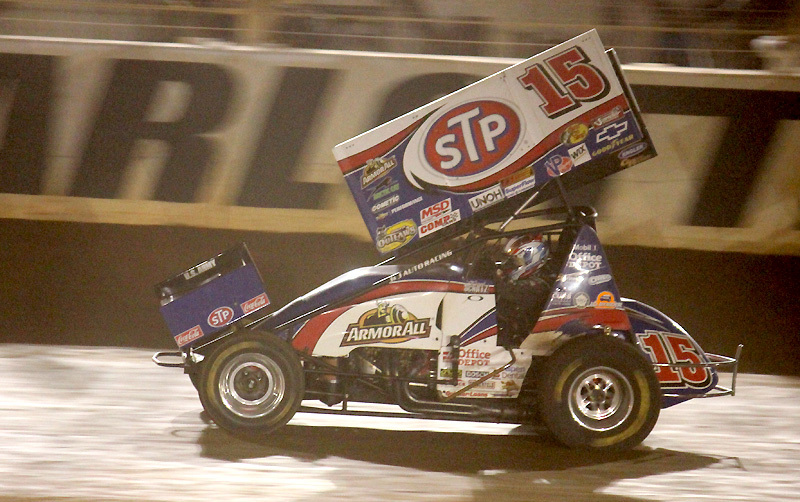 During the third heat, he blew a right-front tire on the Tony Stewart Racing No. 15 STP/Armor All/Chevrolet J&J. His STP crew replaced the tire and he stormed back from eighth to finish third. One more caution may have changed the entire evening, but the yellow never waived and he transferred him into the 35-lap A-Feature. 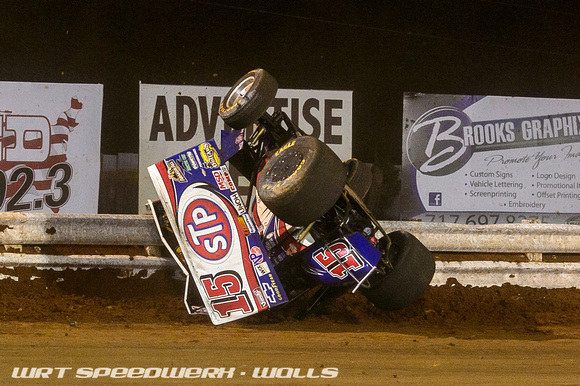 CONCORD, NC – (May 25, 2012) It was a long night at The Dirt Track @ Charlotte Motor Speedway, but in the end Donny Schatz felt good about the final outcome. Following last weekend’s doubleheader in Middletown and Hagerstown, the TSR team spent the week in the Charlotte preparing for the Outlaws 30th race in Charlotte. 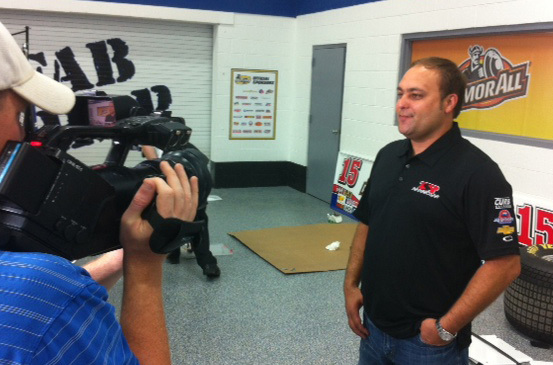 Schatz, who drove the Tony Stewart Racing (TSR) No. 15 STP/Armor All/Chevrolet J&J to a Charlotte sweep in November, came in looking for his seventh win at the 4/10-mile dirt oval and first finish inside the top five in seven races. INDIANAPOLIS (May 22, 2012) – There is something special about being an American on Memorial Day weekend. It’s a time to remember and honor those who protect and serve this country. The sport of auto racing is just about as American as it gets and, on Memorial Day weekend, the sport traditionally takes center stage nationally with major events in Charlotte and Indianapolis. The World of Outlaws (WoO) Sprint Car Series brings its grassroots short-track racing heritage to both regions beginning with Friday’s Circle K NOS Energy Outlaw Showdown at The Dirt Track at Charlotte in Concord, N.C., and concluding Monday with an event at Lawrenceburg (Ind.) Speedway. Tony Stewart Racing’s (TSR) Steve Kinser and Donny Schatz lead the Outlaws into this weekend of opportunity. Kinser, driver of the TSR No. 11 Bass Pro Shops/J.D. Byrider/Chevrolet Maxim, intensified his pursuit of a 21st WoO championship by winning his second race of the season last weekend in New York and, by doing so, climbed atop the championship standings. Schatz, pilot of TSR’s No. 15 STP/Armor All/Chevrolet J&J, comes into the weekend as defending race-winner at both The Dirt Track and Lawrenceburg. Schatz, who has led the WoO championship standings five times in 2012, swept a pair of races at The Dirt Track in last fall’s World Finals and was victorious in the Outlaws’ most recent stop on the high banks of Lawrenceburg in June 2009. Donny will be part of an episode of Outcast Customs’ Livin Large show on Monday, May 21. CHARLOTTE, N.C. (May 21, 2012) – It’s going to be a busy week of channel surfing for fans of the World of Outlaws and Donny Schatz. The four-time WoO champion will be on national television twice this week, beginning Monday night with his appearance on a episode of Outcast Kustoms and concluding with Friday night’s WoO race at Charlotte being aired live on SPEED. HAGERSTOWN, MD (May 20, 2012) – Four-time World of Outlaws (WoO) champion Donny Schatz closed the six-race eastern tour with a tenth-place finish on Sunday night at Hagerstown (Md.) Speedway. The result concluded races in central Pennsylvania, New York and Maryland and proved once again the TSR team will continue to fight for everything they can get. Saying things didn’t go smoothly would be an understatement, but Schatz still finds himself right in the thick of the 2012 WoO championship battle. Following Sunday’s race, the Fargo, N.D., racer remained in third and only 32 points out of the top spot heading into this Friday’s event in Charlotte. GRAND FORKS, ND. (May 18) – It was a rare Friday night when Donny Schatz wasn’t competing with the World of Outlaws (WoO) Sprint car Series on a dirt track somewhere in North America. Instead, the Fargo, N.D. resident traveled a little over an hour north of his home to River Cities Speedway in Grand Forks to continue the development of a special motor (www.Alternative410motor.com) targeted for the regional racer. Schatz had his familiar yellow No. 15 J&J in the field and after coming home second in his heat, he started ninth in the main event. The four-time WoO champion worked his way through the field and was battling for the lead when unexpectedly he had a mechanical problem that ended his night. 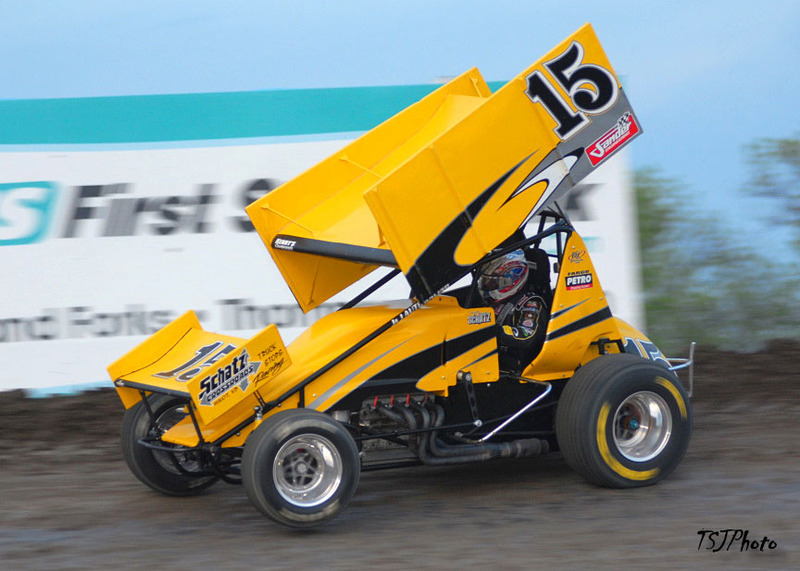 ELBRIDGE, NY (May 16) – If Donny Schatz was looking for a positive following Wednesday night’s World of Outlaws return to Rolling Wheels Raceway, it would be that he made it through the opening lap. That wasn’t the case last fall when an opening-lap crash took out the TSR No. 15 STP/Armor All/Chevrolet J&J. 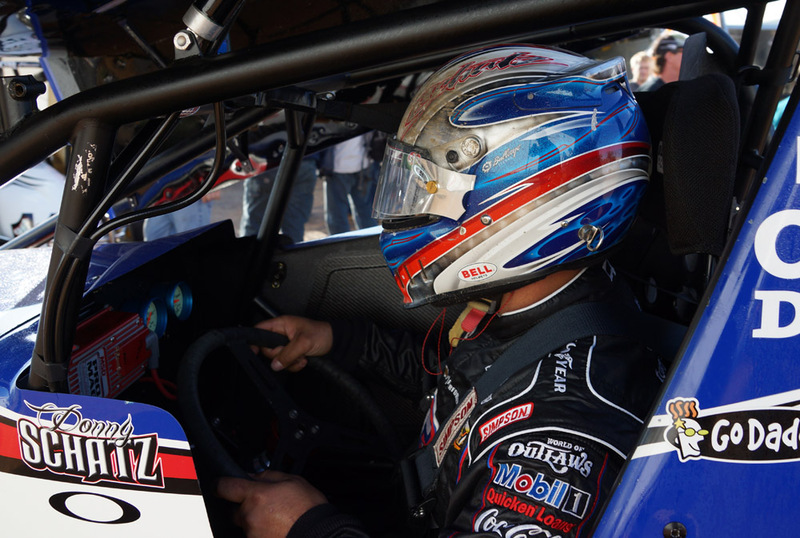 Schatz returned to the big 5/8-mile dirt oval and ultimately finished eighth. The four-time WoO champion was running sixth prior to a lap 23 restart and being on the bottom line was the favorable position. Cody Darrah and Sammy Swindell slipped by dropping him to eighth in the 25-lap A-Feature. INDIANAPOLIS (May 15, 2012) – Now, this is more like it. One week after the World of Outlaws (WoO) Sprint Car Series raced on three consecutive nights, Tony Stewart Racing’s (TSR) Steve Kinser and Donny Schatz, along with the rest of the traveling Winged Sprint car stars, will hit the track three more times this week. A slate that includes a pair of stops in New York, beginning with Wednesday’s race at Rolling Wheels Raceway in Elbridge, N.Y., and concludes with their only 2012 appearance in Maryland. Saturday the Outlaws return to Orange County Fair Speedway in Middletown, N.Y., for the first time since the fall of 2008 and, the following night, the series makes its first stop at Hagerstown (Md.) Speedway since the summer of 2005. CONCORD, N.C. (May 15, 2012) – On Wednesday, June 6 in tiny Rossburg, Ohio, stars representing NASCAR, NHRA, INDYCAR and the World of Outlaws Sprint Car Series align in a big way with the Prelude To The Dream. 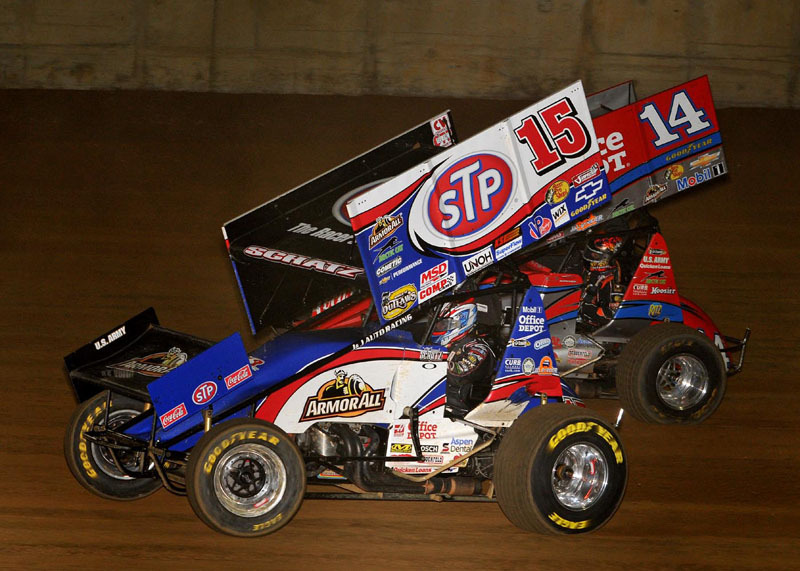 MECHANICSBURG, PA – (May 12, 2012) Donny Schatz headed to Williams Grove Speedway looking to snap a 15-race win draught at the famed half-mile dirt oval. Schatz, entered the doubleheader at Williams Grove as the point leader following a seventh-place finish Thursday night at Lincoln Speedway. 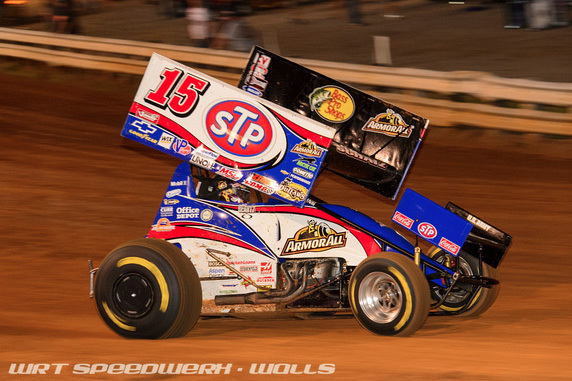 When the dust settled, Schatz left Williams Grove still looking to break the streak.